Samus Aran has returned in incredible form in Nintendo's Metroid Prime for the Gamecube. Designed by Retro Studios, Prime stays true to the original but places the action in an intense 3D environment. Using the first-person perspective puts you inside Samus' Gravity suit. This is an incredible approach. Many classic weapons such as the force beam and the morph ball make return appearances in much cooler form. 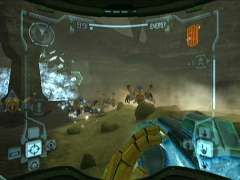 Metroid Prime makes a perfect transition with intuitive controls that are easy to understand. The gameplay is perfectly paced with an excellent balance between exploration and battles. Read our review and find out why Metroid Prime is by far the best Gamecube title ever released. Eight long years have passed since her last adventure on the SNES but it's been well worth the wait. 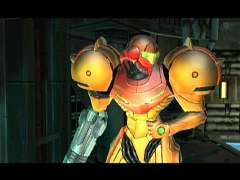 Metroid Prime begins with Samus' spaceship landing on a seemingly deserted space ship that's been over-run by some vicious and deadly alien life forms. Once she hits the deck and enters the ship, Samus will find that the ship has been ripped apart. Most of the space pirates on-board are dead, and those that remain are in no mood to make new friends. A mysterious force has overtaken the ship and she has to watch out for booby traps and laser installations. She moves down through a series of corridors, collecting objects until she reaches the bowels of the ship. Here, she'll face an in an epic battle with a Parasite Queen alien that is mind-blowing and one of the most memorable sequences in any game released this year. Once the Queen has been defeated, you need to escape the ship before its self-destruct sequence activates. After Samus escapes from the ship, she lands on the planet Tallon IV below to find out what's going on. Once you reach Tallon IV, many of the power-ups she received initially are lost and she has to regain them. Here's where Metroid Prime opens up immensely as you explore some massive environments. Metroid Primes first level is incredible, imaginative, evocative, claustrophobic, and epic but it's only the beginning. Navigating these twisting and turning tunnels and corridors will immediately remind you of the original series, though it's more intense now. 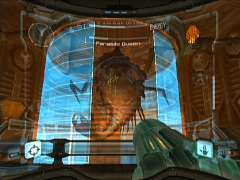 Metroid Prime's later levels become increasingly non-linear, giving you more freedom of movement to explore the worlds. Metroid Prime retains the classic feel of the original series but places it in an amazing 3D environment that's among the most impressive ever seen in a console game. The design is incredible with the spirit of the series surviving the transition largely intact. Instead of taking the traditional 2D perspective, this is an all out state-of-the-art shooter. Metroid Prime is a truly innovative title in a number of areas. For example, instead of taking on a generic viewpoint, you see the action from inside Samus' visor. This gives it a unique feel and the visor is useful because it displays your health, a basic map, weapons, ammo, and game status clearly. This brilliant interface puts you right in the action and enhances the innovative aspects of the game, making for a seamless experience. 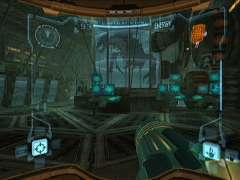 Metroid Prime's first person perspective may lead you to think that its controls are going to be just like other FPS shooters. 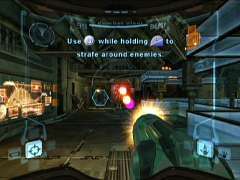 However, it uses an innovative control scheme that is perfectly suited to the Gamecube's controller and Metroid Prime's unique gameplay. During the game, you use the analog stick to move Samus around the screen, and the responsiveness is smooth and silky. Hitting the A button fires her charge weapon, while holding it down charges the weapon and releases an energy burst when released. Using the B button makes her jump. Pressing X will launch her powerful missiles. Pressing Y activates Samus' famous Morph Ball, allowing her to roll through the levels. The Left shift key is used to lock-on to enemies while the Right Shift allows you to look around. Using the Lock on allows you to strafe while still locked on, and you'll find this quite useful when you are facing a boss or numerous foes. The D-pad controls the Visor. The Visor has several different modes including combat, scan, and thermal viewpoints. The combat mode is the default viewpoint, while using the scan key allows you to look for items to scan, indicated by icons. The scan mode opens a small window that magnifies the viewpoint, allowing you to scan stationary items such as computer consoles and switches. You can also scan enemies but more on this later on. You can also scan the boss enemies to find their weak point, which focuses your shots on their vulnerable areas. When you see one of these scan points, you hold down the Left Shift to scan that items information into your suit's database. Another cool effect in Samus visor is the thermal scan, which allows you to find hidden enemies using their heat signatures. In addition to using her standard array of weapons, she can also change into her Morph Ball. The Morphing Ball was featured in the classic Metroid games, but Prime transforms it into something more elaborate and useful. When the Morph Ball is activated, the action switches to a third person perspective where you can roll Samus around the levels. Samus use the Morph Ball to roll through areas blocked by debris or evade laser sensors. Morph Ball mode is also useful in that it allows her to use bombs and even use this shape to open doors in puzzle modes. These controls integrate with the rest of the game and fit the action perfectly. A surprising amount of the gameplay involves exploration where you need to find the various hidden areas. These controls are easy to learn and the initial levels familiarize you with the parameters. Once you've mastered the basics, they become almost second nature, allowing you to concentrate on the action. While there have been some truly impressive titles released for the Gamecube, Metroid Prime sets a new standard. It runs at an incredibly smooth frame rate, which is all the more impressive given the high quality of the visuals. Metroid Prime is an incredibly beautiful and atmospheric game that brilliantly creates an alien world. The sumptuous environments are amazing, constantly exceeding your expectations. These worlds seem alive with brilliant light-sourcing, realistic water, outstanding animation creating a convincing otherworldly experience. The first-person perspective is unique and the slightly curved viewpoint is perfect. The game integrates Samus' visor into the action perfectly. This makes for some amazing effects. For example, you can see water droplets, condensation, fog and sweat forming on the visor as you traverse Tallon IV, making you feel like you're actually inside the Gravity Suit. This is impressive not to mention the fact that the aliens' innards splatter over the visor when you kill them, which makes the game even more intense. The alien designs are amazing with a cool insectoid look, and are detailed and frightening and animate perfectly giving them a disturbing look that's quite menacing. This is especially true when you face a swarm of them. 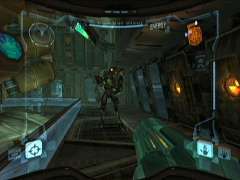 Metroid Prime's soundtrack features some remixed version of the original score for nostalgic purposes while other tracks sets an ominous mood with ominous choral arrangements that seem to follow the action perfectly. The brilliant music helps to add to the tension and chills, further immersing you into the action to an incredible degree. While many have expressed doubt about the Gamecube hardware's ability to compete with the other consoles, Metroid Prime's production values set those worries to rest. The game has a visual polish that rivals the best seen on any other modern console to date. When this title was announced, many gamers expressed doubts that 3D Metroid could work. With a relatively unknown second-party developer at the helm, these worries multiplied. However, sometimes perceptions and prejudices can be flat out wrong and we're happy to report Metroid Prime is amazing from end to end. Far from the disaster many predicted, this is a triumph. Metroid Prime is outstanding, far exceeding your highest expectations repeatedly. The intuitive controls are innovative and intuitive, yet are transparent enough after awhile to become second-nature. Metroid Prime's gameplay is outstanding and the balance will challenge both sides of your brain, giving your reflexes and puzzle solving skills a thorough workout. Gamers will explore some of the most impressive levels ever devised, from both an aesthetic and layout standpoint. Very few games have ever come as close to creating as cohesive and believable world as the one seen here. There can be little doubt that this title has pushed the extremities of the Gamecube. In fact, few titles for any platform can approach the sheer excellence of this flawlessly implemented masterpiece of game design.